The 2013 American Buffalo Gold Proof Coin is offered by the United States Mint as the eighth annual numismatic release of the American Buffalo Gold Coin Program. The series debuted in 2006 in both proof and bullion versions and is struck from one ounce of .9999 fine 24-karat gold. Proof quality coins are described by the US Mint with the following statement : "The term "proof" refers to a specialized minting process that begins by manually feeding burnished coin blanks into presses fitted with special dies. Each coin is struck multiple times so the softly frosted and highly detailed images seem to float above the field. " This process typically results in a coin with enhanced details over similar bullion coins. As such, collectors tend to prefer the proof variety for that detail as well as the more limited mintage of a numismatic release over a bullion counterpart. American Buffalo Gold Proof Coins feature a legal tender face value of $50. 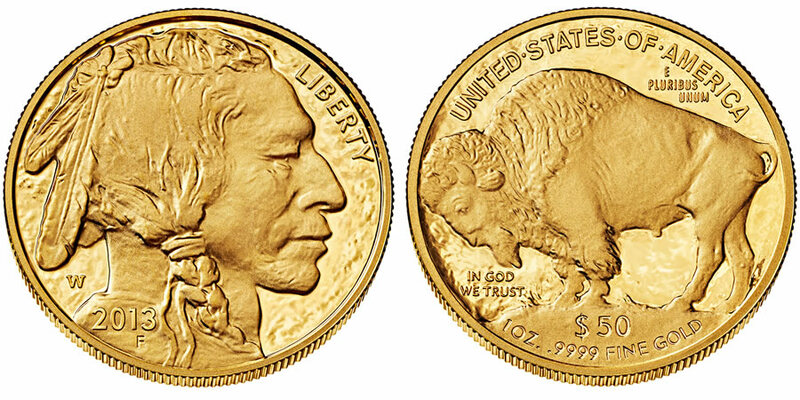 The American Buffalo Gold Coins take their name from the imagery found on both the obverse and reverse. These designs were first seen on the 1913 circulating nickel nicknamed the "Indian Head Nickel" or the "Buffalo Nickel." The designs were created by James Earle Fraser and include a profile of a Native American on the obverse. Obverse inscriptions include LIBERTY, the year of production and a mintmark. Shown on the reverse is the image of an American Buffalo, more properly referred to as a bison. It was also designed by James Earle Fraser and is surrounded by the inscriptions of UNITED STATES OF AMERICA, E PLURIBUS UNUM, IN GOD WE TRUST, $50 and 1 OZ .9999 FINE GOLD.